Winter is finally giving way to warmer weather, so it’s time to start doing some Spring cleaning around here. My pitiful front porch has been sitting here since the day after Christmas looking all sad and dejected. I never really removed all my Christmas decor. I just took down the dead evergreen wreaths and left the rest sitting out there in the cold. But finally, this weekend, I got around to making the porch presentable for the Spring and Summer months ahead. Here is what it looks like now! So many of y’all have asked me for more instructional videos about how to decorate your houses, so I made this little video to show you guys how simple this porch facelift was. If I had not been taking photos, this porch update would have taken me about 30 minutes or less. 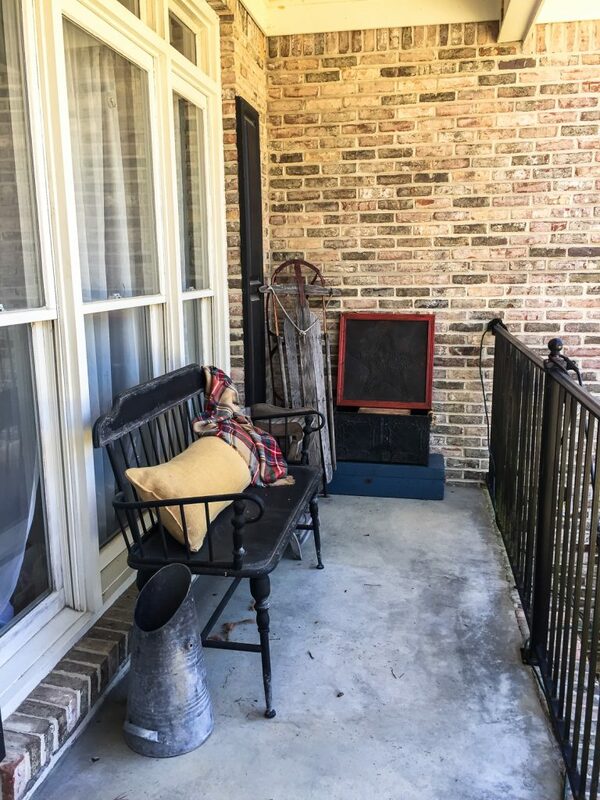 The secret to a pretty porch? It’s all about layering in varying heights of colors and textures. Start with a clean slate. Remove anything that is not going to stay and sweep up the floor. 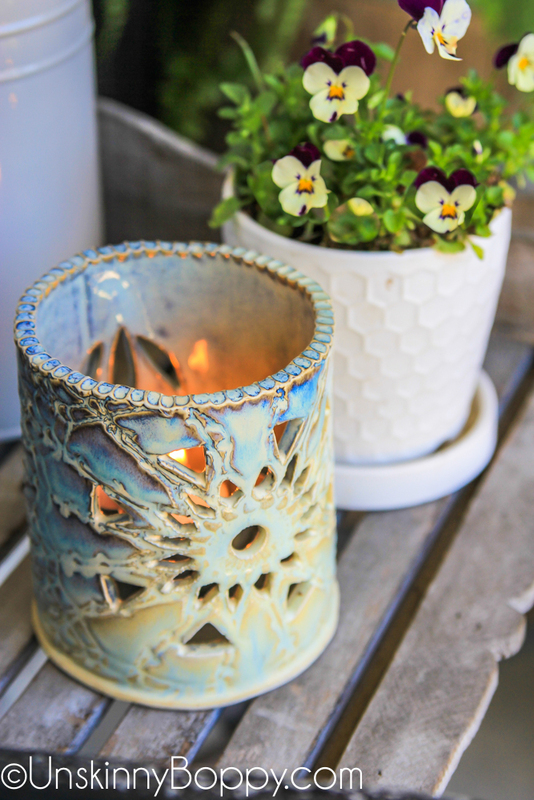 Have a few base pieces of furniture that never leave your porch and decorate around them. Put down a amazing rug that you absolutely love. Layer in pillows and pretty (but durable) fabrics to soften things up. Add your favorite plants and greenery. This is the key to a beautiful porch. Keeping them alive all summer is the hard part. 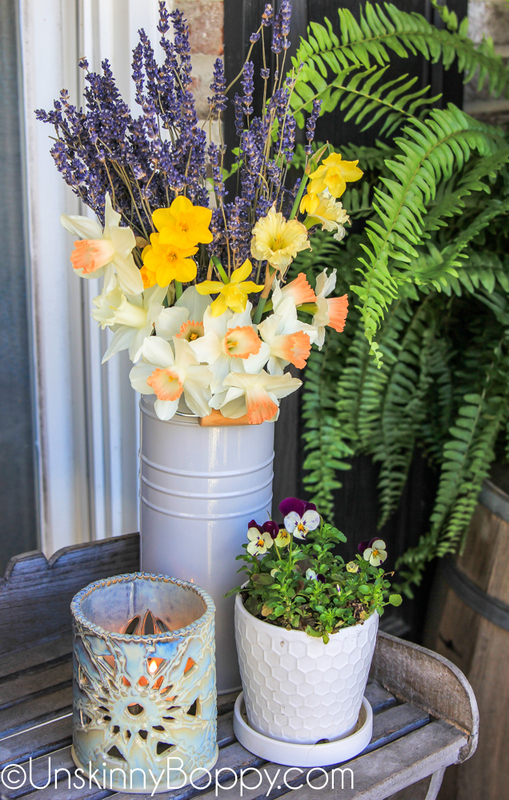 Vary the heights of decor and greenery by using unique plant stands or wooden crates. You can never have too many white buckets. My best tip for easily decorating your home is to have a few key pieces that you absolutely LOVE that you can rotate in and out of different vignettes around your house. I found the black wrought iron bench a few years ago at a local antique store. It’s a great anchor piece for my porch so it stays all year round and I just decorate around it. Take my 2016 Spring Home Tour to read more about the bench. The only new things I bought in this photo were the purple flowers and violas (which I bought off the garden clearance rack at Lowes for $3 each.) and the Boston fern. Everything else came from inside my house. I found this little ceramic luminary at a local thrift store for $2.00 and thought it was super cute, so it came home with me. The daffodils came from my yard. They are blooming their little heads off already. 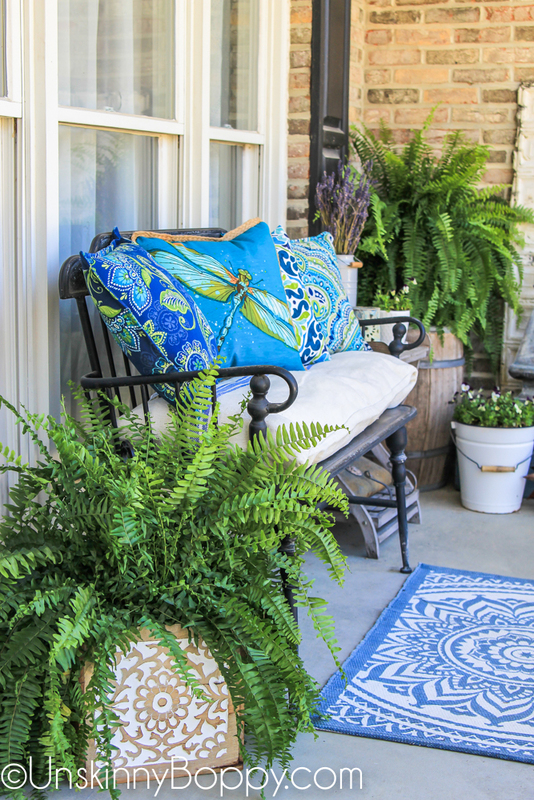 My biggest splurge for this porch post were these pretty outdoor pillows that I found at Lowes. I love the bright colors of these pillows. The seat cushion is just an old body pillow stuffed inside my favorite french grain sack. 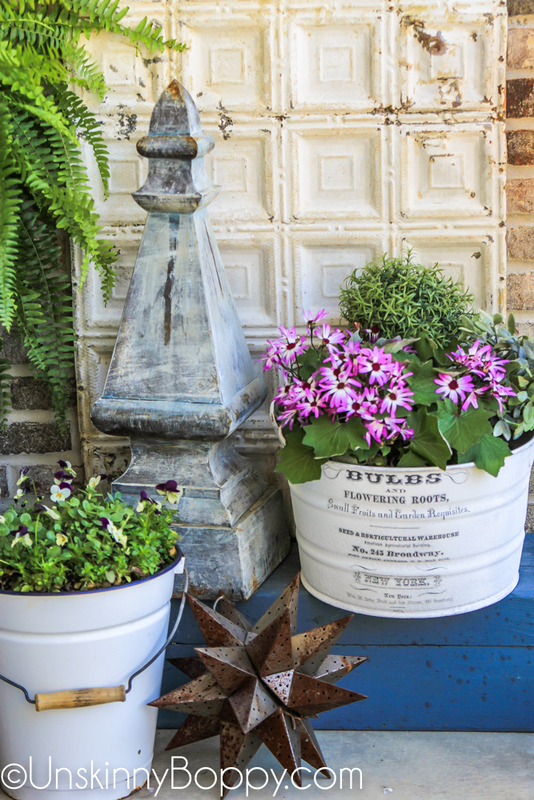 I hope you can take some these tips and run with them to decorate your own front porch! « Harry Potter World Part 2: Hogwarts Here we Come! So fresh and pretty Beth!!! 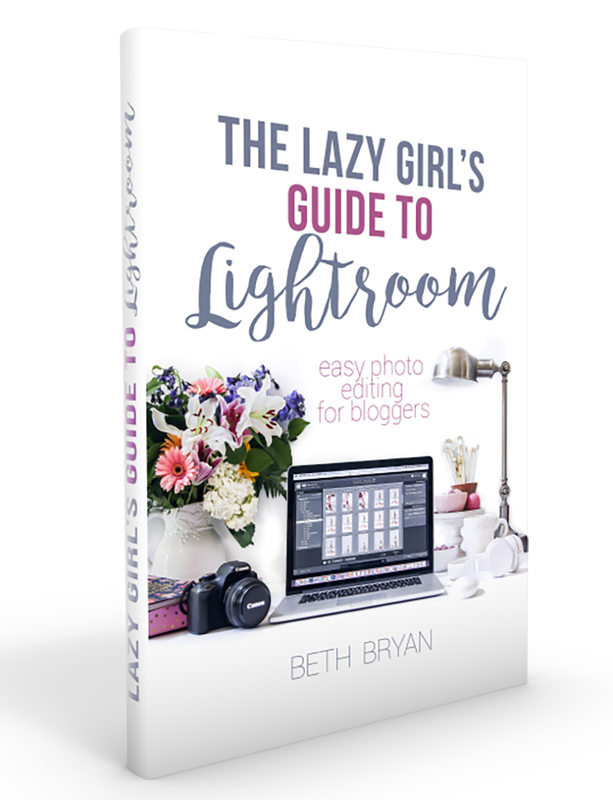 Lovely, Beth! I thought the daffodils were faux! What the heck… those white and orange ones! Crazy! You did a great job! Agreed, never too many white buckets! This is a beautiful spring porch, I can’t wait to do ours, once it stops snowing all over the place – HA! Thanks for the inspiration! Such a fresh and colorful porch, Beth. 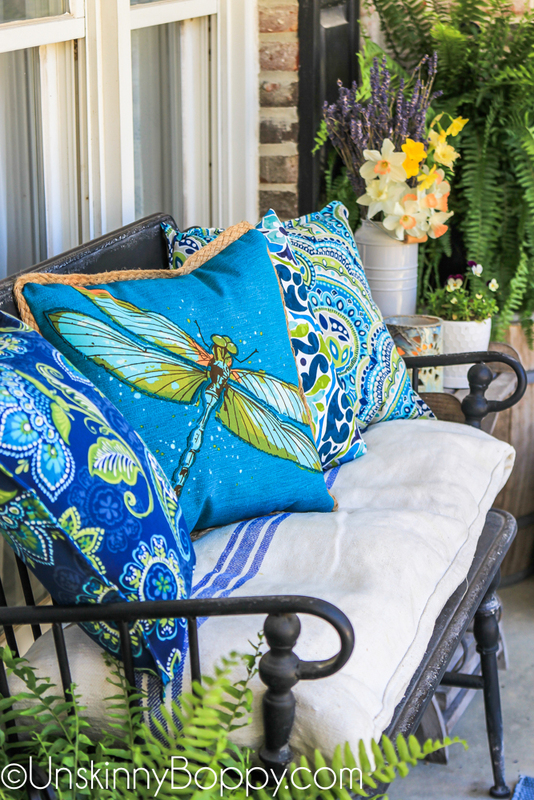 Love your choice of pillows – especially the dragonfly! Thanks so much for being on the tour! Great guide for a pretty refreshing porch for spring season. I love this post.